We have upgraded our knife and scissor sharpening equipment. Check "The New Store Page" for pictures and on going stories of our progress. Slide show added showing the work room where all the repairs are made. Saturday March 10th with pizza supplied by Fireside Pizza. Opening week went far beyond any of our expectations. Mom was busy all week in the front and Dad was back on the machines (temporarily pulled from retirement). The support we received from Ruth Piano Movers, Channel 11, Channel 5, The Star Tribune, Public Radio, our loyal customers and the community has made this move very smooth and successful. It is difficult to fully express our gratitude for all the help so freely given to us. We are looking forward to providing our best service and answering any of your questions. 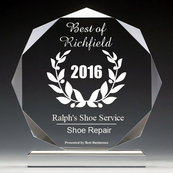 Ralph’s Shoe Service has endeavored to provide high quality and friendly service to the community since 1947 and will continue to do so. 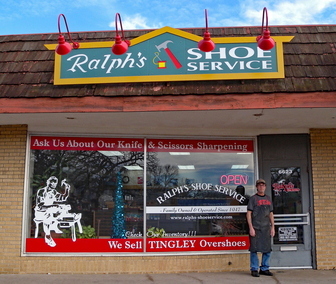 As a family shop, it is now in it’s third generation of ownership. William (Bill) Roase is the grandson of the founder Ralph Roase. Custom work is our specialty whether it is a special repair or dyeing to match a preferred color. Our services and products are listed separately on this site.